The post of prime minister has been scrapped and the president will now be able to select his own cabinet, regulate ministries and remove civil servants, all without parliamentary approval. Tayyip Erdogan was sworn in again as Turkey’s president on Monday, assuming sweeping powers he won in a referendum last year and sealed in a hard-fought re-election victory two weeks ago. Erdogan, who has dominated Turkish politics for 15 years, says the powerful new executive presidency is vital to drive economic growth, ensure security after a failed 2016 military coup and safeguard the country from conflict in Syria and Iraq. “As president, I swear upon my honour and integrity, before the great Turkish nation and history, to work with all my power to protect and exalt the glory and honour of the Republic of Turkey,” Erdogan told parliament as he took the oath of office. Supporters in parliament gave him a minute-long standing ovation after he took the oath. Some opposition parliamentarians remained seated while others stood without applauding. The lira, which gained more than 1 percent earlier on Monday to 4.51 against the dollar, briefly fell back sharply after a government decree removed a clause stipulating a five-year term for the central bank governor. An adviser to Erdogan later said that the governor’s term would remain at five years. 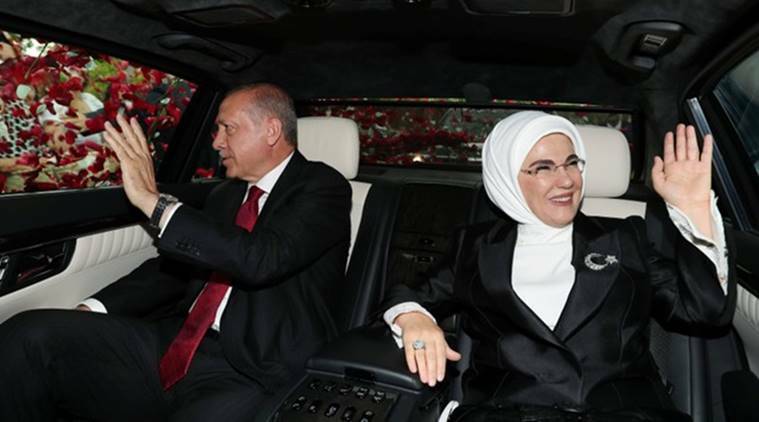 The introduction of the new presidential system marks the biggest overhaul of governance since the Turkish republic was established on the ruins of the Ottoman Empire nearly a century ago. The post of prime minister has been scrapped and the president will now be able to select his own cabinet, regulate ministries and remove civil servants, all without parliamentary approval. Erdogan’s supporters see the changes as a just reward for a leader who has put Islamic values at the core of public life, championed the pious working classes and overseen years of strong economic growth. Opponents say the move marks a lurch to authoritarianism, accusing Erdogan of eroding the secular institutions set up by modern Turkey’s founder, Mustafa Kemal Ataturk, and driving it further from Western values of democracy and free speech. State television channel TRT broadcast Erdogan’s described Monday’s swearing-in as the “first day of the new Turkey”. It later showed him visiting Ataturk’s mausoleum in the capital, Ankara. Marc Pierini, a former EU ambassador to Turkey and a visiting scholar at Carnegie Europe, said Erdogan’s new powers would effectively make him a “super-executive president”. “Most powers will be concentrated in his hands, there will no longer be a prime minister, and almost none of the checks and balances of liberal democracies will be present. In other words, Turkey will be an institutionalized autocracy”. Erdogan is expected to name a streamlined cabinet of 16 ministers on Monday evening after a ceremony at the presidential palace for more than 7,000 guests, including Venezuelan President Nicolas Maduro, Russian Prime Minister Dmitry Medvedev and Sudan’s President Omar Hassan al-Bashir, who is wanted for war crimes by the International Criminal Court. No major Western leader featured on a list of 50 presidents, prime ministers and other high-ranking guests published by state news agency Anadolu. NATO member Turkey’s relations with its Western allies have been strained by disputes with the United States over military strategy in Syria and by European Union criticism of Ankara’s large-scale purges of state institutions, armed forces, police and media following the failed coup. Investors were waiting to see whether cabinet appointees would include individuals seen as market-friendly, and particularly whether Mehmet Simsek, currently deputy prime minister, would continue to oversee the economy. “For the cabinet appointments in the past several years, the most important issue has been the presence of the current deputy prime minister, Mehmet Simsek,” said Inan Demir, a senior economist at Nomura International. The lira, which is down some 16 percent so far this year, firmed to its highest level since mid-June before falling back to 4.61 against the dollar. It stood at 4.5570 against the dollar at 1445 GMT. The currency has been battered by concern about Erdogan’s drive for lower interest rates and comments he made in May saying he planned to take greater control of the economy after the June 24 elections. Inflation surged last month above 15 percent, its highest level in more than a decade, despite interest rate hikes of 500 basis points by the central bank since April.